Do you ever have one of those days where you really want something sweet to eat but don't know what to make? I have those days several times a week, lol. Especially when I'm looking for new recipes for the blog. So while I was looking in the cupboard the other day trying to come up with something that wasn't the same old cookie or cake recipe, I spied a few bags of Betty Crocker Cookie Mixes that I had bought over the holidays and hadn't used yet. 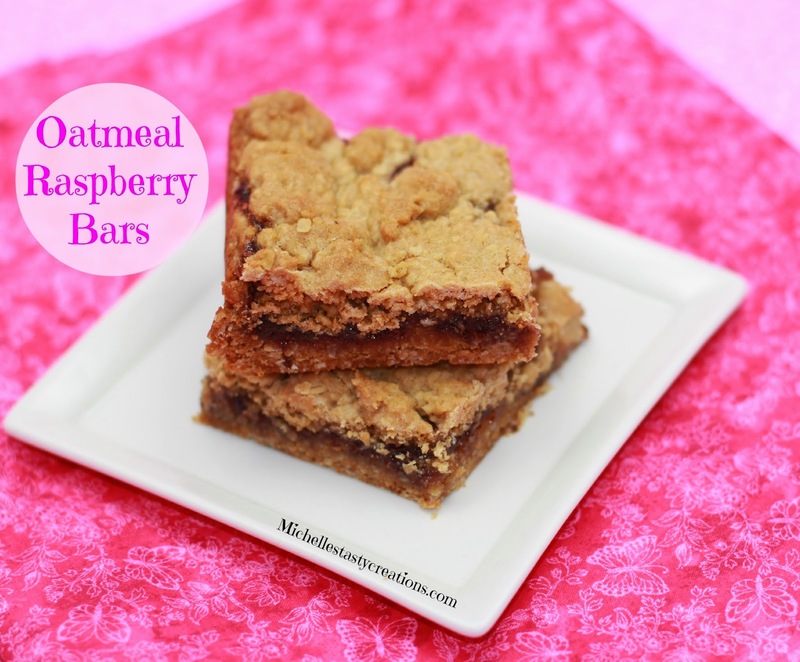 I immediately knew I wanted to make some kind of bar recipe with the bag of oatmeal cookie mix and raspberry jam which happens to be my favorite! These are the bars I came up with and you'll definitely want to try them right away. They are not too sweet, which is how I like my desserts, yet very delicious! 1 cup raspberry jam, seedless or regular (any flavor jam will work) at room temperature and stirred until smooth. Pre heat oven to 350 degrees. Line an 8 x 8 pan with parchment and spray with cooking spray. In a medium bowl mix the cookie mix and butter until crumbly. Add the beaten egg and mix until it is incorporated and forms clumps. Place 1/2 the dough in the pan and press into the bottom evenly. I wet my hands with a little bit of water so the dough doesn't stick to my fingers. Bake for 10 minutes. Remove from oven and add the jam, spreading to within 1/4 inch of the edge. Add the 2 Tbs. of flour to the remaining dough and mix until more crumbly. Drop by pieces to cover as much of the jam filling as you can. Place in oven and bake for 30 - 35 minutes or until golden brown. Cut into as many pieces as you would like and eat up! Just found my next baking recipe! I love, love, love raspberry jam (seedless) and since I've done the apple/caramel version of these bars so many times, I know this will be another winner.